PUNGGYE-RI, North Korea — North Korea carried out what it said was the demolition of its nuclear test site Thursday, setting off a series of explosions over several hours in the presence of foreign journalists. The blasts at the test site in the sparsely populated northeast were supposed to build confidence ahead of a planned summit next month between North Korean leader Kim Jong Un and President Donald Trump. But Trump canceled the meeting on Thursday, citing the "tremendous anger and open hostility" in a North Korean statement released earlier in the day. The explosions were centered on three tunnels into the underground site and a number of observation towers in the surrounding area. North Korea held a closing ceremony afterward with officials from its nuclear arms program in attendance. The group of journalists that witnessed the demolition, which touched off landslides near the tunnel entrances and sent up clouds of smoke and dust, included an Associated Press Television crew. North Korea's state media called the closure of the site part of a process to build "a nuclear-free, peaceful world" and "global nuclear disarmament." But even as North Korea made good on its gesture of detente, it lobbed a verbal salvo at Washington, calling Vice President Mike Pence a "political dummy" and saying it is just as ready to meet in a nuclear confrontation as at the negotiating table. Trump responded by canceling the summit, saying in a letter to Kim: "Sadly, based on the tremendous anger and open hostility displayed in your most recent statement, I feel it is inappropriate, at this time, to have this long-planned meeting." North Korea's decision to close the Punggye-ri nuclear test site had generally been seen as a welcome gesture to set a positive tone ahead of the summit. In a statement earlier Thursday, South Korea's National Security Council called it the North's "first measure toward complete denuclearization." Not everyone was as optimistic, however. The closing of the site is not an irreversible move and would need to be followed by many more significant measures to meet Trump's demand for real denuclearization. North Korea also did not invite international nuclear weapons inspectors, opting instead for the impact of the television footage to impress the world. Trump meets with South Korea's Moon Jae-in: Will Kim Jong Un summit happen? The event was, indeed, impressive. The first blast the visiting journalists witnessed came at around 11 a.m. after they made a 12-hour plus trip by train and convoy through the night and over bumpy dirt roads. That explosion collapsed the complex's north tunnel, which was used for five nuclear tests between 2009 and last year. Two other explosions, at around 2:20 p.m. and 4 p.m., collapsed the west and south tunnels, according to officials. 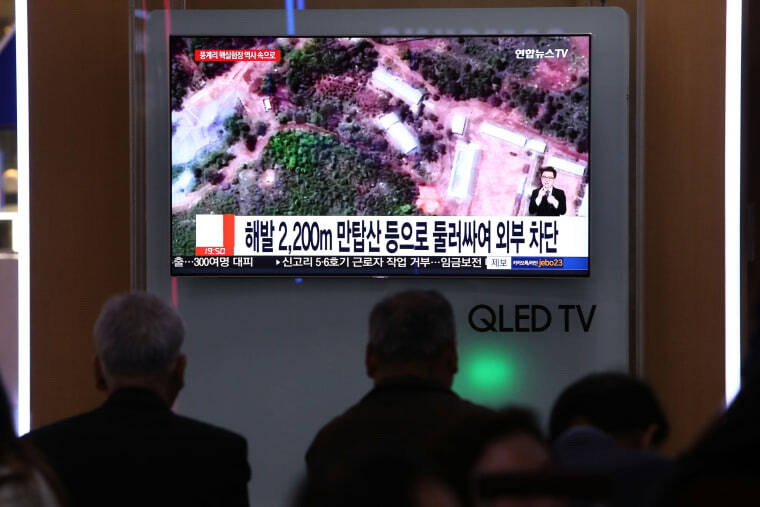 North Korea's state media stressed that those two tunnels could have been used to carry out more tests at any time, countering reports that the Punggye-ri site had been rendered largely unusable after the six tests already conducted there. Also blown up were observation posts and barracks used by guards and other workers at the facility. A tunnel on the eastern side of the facility had already been shut down after an initial nuclear test in 2006. North Korea said the demolition of the facility did not cause any leakage of radioactive materials or have any "adverse impact on the surrounding ecological environment." The journalists were allowed to stay at the site for about nine hours. Back in Pyongyang, the outburst directed at Pence, issued in the name of a top foreign ministry official, came on the heels of another sharp rebuke of Trump's newly appointed national security adviser John Bolton and raised concerns that a major gap had opened between the two sides. Choe Son Hui, the vice minister of foreign affairs, was quoted Thursday by the North's state-run news agency slamming as "ignorant" and "stupid" comments Pence made in an interview with Fox News that compared North Korea to Libya, saying they showed "what a political dummy he is." She also questioned whether the summit would be worthwhile. "We will neither beg the U.S. for dialogue nor take the trouble to persuade them if they do not want to sit together with us," KCNA quoted her as saying. "Whether the U.S. will meet us at a meeting room or encounter us at nuclear-to-nuclear showdown is entirely dependent upon the decision and behavior of the United States." The summit plan had hit a number of speed bumps recently. Trump met with South Korean President Moon Jae-in on Tuesday at the White House for consultations and suggested the summit could be delayed.